When news began circulating that Mohamed Abdool Shameer, 58, had been involved in a boat collision in the Pomeroon River, his relatives were expecting his body to float up in three days. Instead they had to journey more than 60 miles to Moruca where he was found gutted and buried in a shallow grave. It has been more than a month, and the man’s grieving relatives say they are stunned by the delay in the police investigation. Calling what occurred murder, they said they are being denied justice and even levelled allegations that there might have been a “fishy” deal between the police and those involved in the incident. Among those arrested were the driver of the boat who is closely related to Shameer and another man who led the cops and relatives to the body. However they have both been released without charge. Relatives have expressed fear that those implicated in the incident might attempt to flee the country even though police are in possession of a statement implicating them both in the crime. 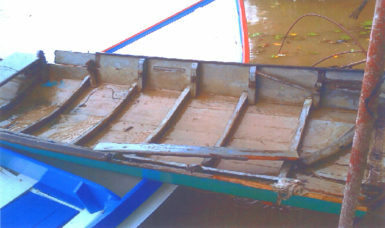 Mohamed Shameer’s badly damaged boat. Commander of `G’ Division Kevin Adonis told Stabroek News when contacted that the CID Headquarters, Eve Leary is now dealing with the matter. He said that sometime back Shameer’s relatives had visited him inquiring about the case and he made contact with his counterparts in the city for an update. He said that he was told that the investigators are awaiting a statement from MARAD which was needed to complete the police file. “They are finished and waiting on that [the statement],” he stressed. Adonis related that once this is received it would be added to the file which would be sent to the office of the Director of Public Prosecutions (DPP) for advice. He said he had related all of this to the man’s relatives when they visited him. A distraught Khirool Noorajhan, the dead man’s sister, is not taking the lack of action lightly and is appealing for charges to be laid. Shameer, the eldest of nine children was left disabled after contracting polio when he was a child. Despite this, he farmed fruits to sustain himself. Noorajhan recently told Stabroek News that her brother had left his Jacklow, Pomeroon home in a paddle boat around 7.30 pm on April 25, to visit a friend. It would appear that he was on his way back home when he was ran over by a 75 horse power boat. As it turned out, she said, the driver of the other vessel, a boat builder, is a close male relative who was not on speaking terms with Shameer at the time. 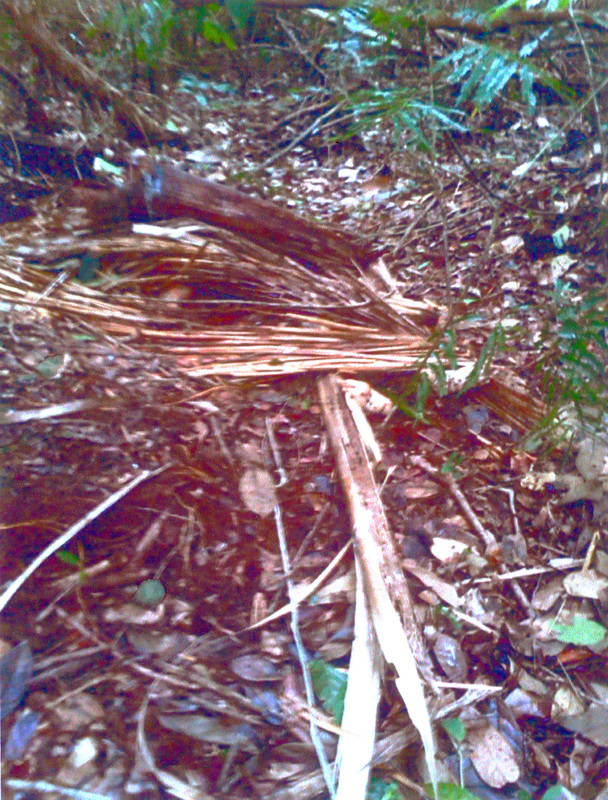 The savannah area in Moruca where Mohamed Shameer’s body was found in a shallow grave covered with tree branches. This area is located more than 60 miles from where his boat collided with a larger vessel. After the collision, his body was retrieved from the water and transported to this area. later led the police to the body. Noorajhan said relatives received news of the collision on April 26. She said that a resident living near the scene related that he had heard the collision and looked out, inquiring if help was needed. She said the impact resulted in Shameer falling overboard. The resident saw those in the larger boat pulling a body out of the river. The boat then drove off leaving Shameer’s mangled boat behind. The boat, she said, headed in the direction of where the boat builder’s father lives. The boat builder’s mother was a close relative of Shameer. The boat was later driven from that location to a “koker trench,” she said, and a woman living near there recalled hearing strange noises. The boat remained in that area for about an hour. A report was made at the Charity Police Station the following day. She said police questioned the boat builder but he claimed he was at home all night watching television. Several persons were questioned about his supposed alibi and they were all later detained and taken to the police station. According to Noorajhan, relatives received information that the man had disposed of Shameer’s body. That information was passed on to the police. Shameer’s badly damaged boat was found tied to a landing not far from where the collision had occurred. She said the police kept telling her that the “body gotta float” and that they have to wait. She said that for two days they searched the river but found no sign of Shameer. The woman said that on the fourth day they returned to the station to make inquiries about why the boat builder’s friend was released. The woman alleged that an arrangement was made with the police to have him released. She said that on her insistence the police rearrested him and initially the man did not want to provide the police with information. Under pressure, he cracked and told the police everything he knew. She claimed that based on what she was told the young man told the police that after the collision they noticed Shameer “going down” and pulled him up and placed him in the boat they were in. She said it was related to the police that the original plan was that the body would be gutted and dumped in the ocean. The gutting, she explained, was to ensure that it did not float up. The woman claimed that the man related that before they could dump the body they noticed the Coastguard on patrol and it was then decided that they would go into Moruca and bury the remains. The woman along with other relatives, hired a boat to transport the lawmen and the young man to the area to retrieve the body. “The boy show me small brother whey de body deh… The body din done start stink and everything. We had to wrap it up and bring it to Charity,” she said. Her husband, Lalbachan Hemendranauth, interjected that they had to walk a mile into the savannah to the spot where the body was. “He claiming that he panic when he hit this body. When you panic is like you frighten,” Noorajhan reasoned. She then questioned how it was possible to gut a body and pilot a boat for such a long distance while in a panic. The woman drew a sketch of the distance that the relative and his two accomplices had to travel to bury the body. Based on her drawing, they would have travelled 48 miles to the Atlantic Ocean and another three miles to the Moruca River. From there it was at least another 15 miles to where the body was discovered. 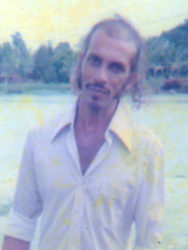 Shameer was found in a shallow grave covered with tree branches. His shirt and shoes were missing. 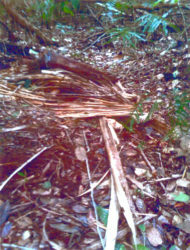 There was a wooden stave in his chest, pinning him to the ground. Noorajhan said she would later learn that that was done to keep the body in place in case the area flooded. She said too that her understanding was that the body was to be burned. 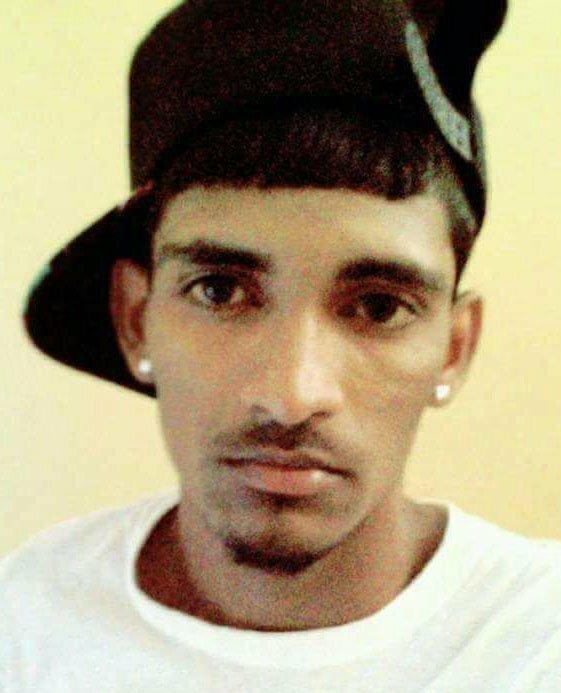 A post-mortem examination done at the Suddie Hospital Mortuary revealed that Shameer died from multiple injuries caused by “a dull object and a sharp object,” Noorajhan said. She noted that even though the man had given critical pieces of information and had led police to the body, both he and the boat builder were released. The man had also implicated the boat builder in the transport and burial of Shameer’s body. Since then the family has endured a runaround to get information. She is of the opinion that murder charges should be levelled against those involved. “… You could panic…, even if you carry the body dead self to the hospital…,” she said. The woman and her husband insisted that had Shameer been taken to the hospital or the police station he may have been alive today. “Nobody can pronounce that man dead unless he is checked by a doctor… Yes he could have been alive,” she said. The woman said she could not definitively say that the collision was a wilful act. However, she related that there was division in the family. The boat builder and his father have not been talking to his mother and her side of the family for many years now. She said she travelled to Georgetown and met a senior officer at Eve Leary. She was told that the investigation was with Transport and Harbours and that she could contact him later in the week for an update. The woman made it clear that she was not satisfied with the pace of the investigation as so many weeks have passed since Shameer’s gutted body was discovered. “They release on the 72-hour… They find the dead man and [they] admit ‘we kill am, we put am deh.’ What else yuh want? 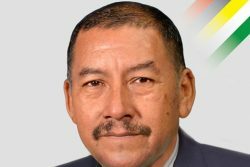 What other evidence yuh want?” Hemendranauth questioned. They have also visited the DPP’s office as well as the Police Complaints Authority for help.